Even though I will never personally purchase another Gucci bag, I am still a bag addict who can appreciate beautiful craftsmanship. The Gucci Hysteria Python Bag (Medium) is absolutely amazing – the shape, the style, the skin – all of it is sure to make a true bag-a-holic drool. 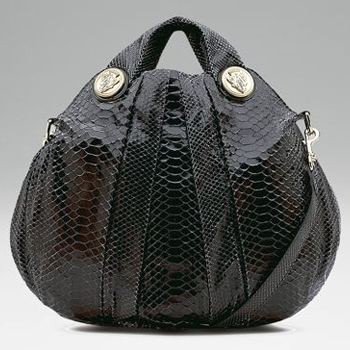 This large top handle bag is made of pure black python with short double handles, a detachable shoulder strap, magnetic snap closure and metal Gucci crest buttons. There are edgy, overlapping flaps on the front of the bag and the rounded shape is adorable. If I was still engaging in my love affair with Gucci and had four grand to spare, this is a bag I’d definitely look forward to having grace my arm. Measures 17"W X 14"H X 1½"D. Made in Italy.